7pm in The Recital Hall. The Recital Hall is located within the Commuications Building at The Evergreen State College. It is ADA accessible. 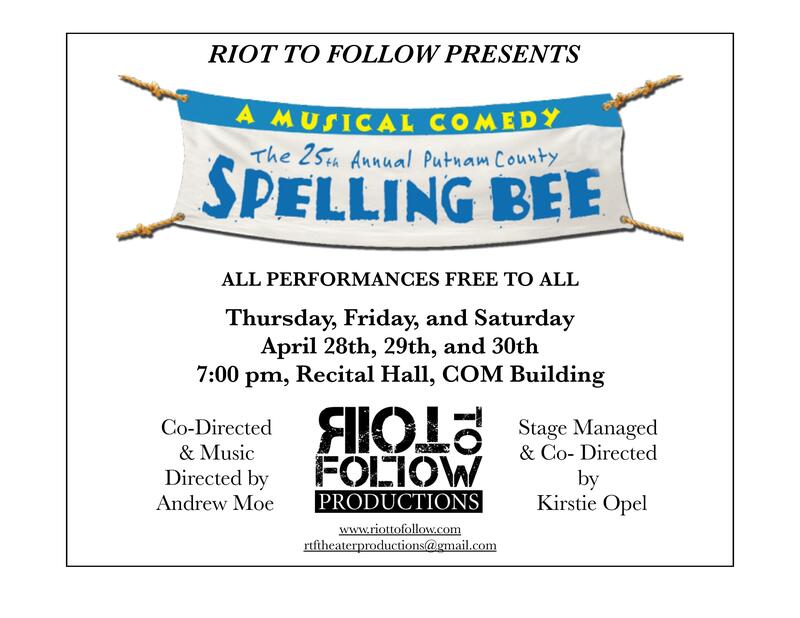 “The 25th Annual Putnam County Spelling Bee” is a free musical, but parking is $2 on both Thursday and Friday night. Parking is free on Saturday night. We hope to see you there! We recently held auditions for our upcoming production of The 25th Annual Putnam County Spelling Bee, and are happy to announce that we have the cast list! We saw a great deal of talented actors and singers and had a very hard time casting this show, but feel that we came up with the best combination of those who auditioned. We are incredibly excited for this production and look forward to seeing everyone at the performances in late April! Riot to Follow Presents: But Why Bump Off Barnaby? A murder-mystery play by Rick Abbot. Thursday, Friday, and Saturday, January 14th, 15th, and 16th, at 7:00 pm. In the COM Building Recital Hall at The Evergreen State College. The performances are free and everyone is welcome. Donations are gladly accepted! This lunatic show poses a fascinating mystery. When Barnaby Folcey is murdered at a family gathering at Marlgate Manor, it transpires that he had a motive to murder everybody else but no one had a reason to want him dead. While dying, he scrawled the letters “b- a-r,” which can implicate everyone. While the bizarre group frantically tries to unmask the murderer, people vanish, poison is found in the sherry and the police take forever to arrive. Any student is welcome to audition! We love seeing new faces at our auditions! 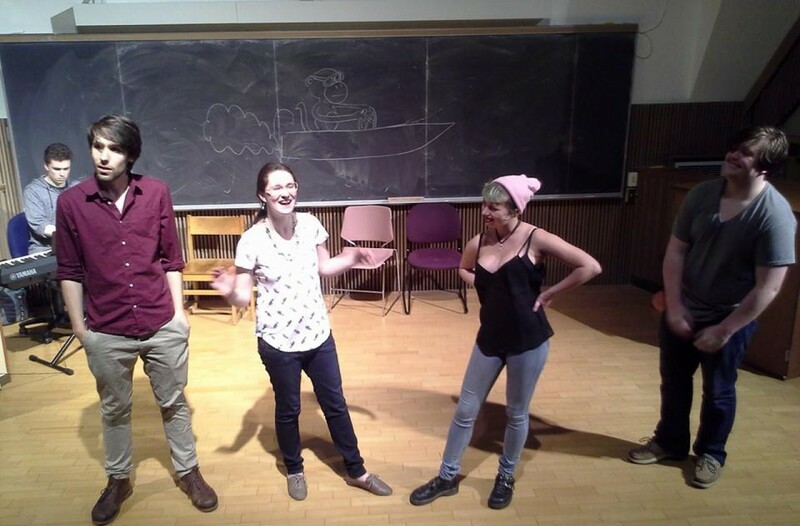 Auditions will consist of cold readings from the show, so no need to prepare a monologue. If you are interested in tech, either email us, or come to the audition and let us know! RIOT TO FOLLOW PRESENTS: OUR 2015-2016 SEASON! We are proud to announce that we will be producing one full length play and one full length musical. Our Winter show, which will go up in mid-January 2016, will be the raucous mystery-comedy, “But Why Bump off Barnaby”, by Rick Abbott. Our spring musical, which will go up around the end of April 2016, will be The 25th Annual Putnam County Spelling Bee. We look forward to sharing all these productions with you, and keep your eyes open for future posts about auditions, interest meetings, and exact performance dates!